Juan Luis Londoño Arias (1994) also known as Maluma, is a celebrated Colombian Reggaeton singer. Following an early passion for music and song writing, Maluma produced his own music and was well received by local radio stations and audiences in his native Colombia. Maluma's career has seen him collaborate with renowned artists such as fellow countrywoman Shakira, Ricky Martin, Timbaland and Jason Derulo. Maluma's breakthrough out with the Spanish speaking audience was with his single "La Temperatura" which broke into the North American singles chart and was shortlisted for a Latin Grammy nomination in 2013. Maluma's collaboration with Shakira, "Chantage" could be considered one of his most outstanding accomplishments, it was a roaring success and the music video received over a billion views in under six months. 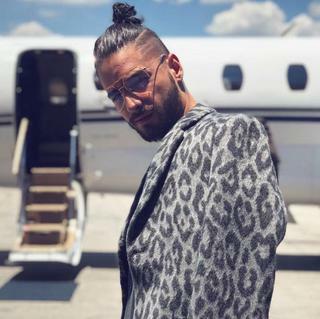 Maluma has since continued to produce highly anticipated music but has widened his scope by starting to not only produce music in Spanish but also in English. In 2018, Maluma released his album "F.A.M.E." which topped the Latin American Album chart and reached number thirty-seven on the U.S Billboard 200.